Quantum criticality, a phenomenon that is particularly relevant in strongly electron-correlated systems, refers to phase transitions that take place at absolute zero and are driven by zero-point quantum fluctuations. Over the past several decades, the experimental and theoretical study of quantum critical points has revealed intriguing new phenomena in materials. New experiments have established the presence of quantum criticality in the newly-discovered iron selenide based superconductors. 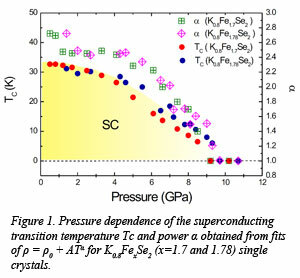 One member of this class of compounds, K0.8FexSe2 (x = 1.78, 1.80), recently was found to become superconducting above 30 K, but its transition temperature declines until it approaches absolute zero with the application of pressure. This finding is of importance because pressure enhances the superconducting properties of a number iron pnictide-based materials. Carnegie scientists Xiao-Jia Chen and Ho-kwang Mao and their collaborators have found that the K0.8FexSe2 system can be driven to a quantum critical point in the pressure range 9.2-10.3 GPa (Figure 1). This observed quantum criticality provides important information on the underlying mechanism of superconductivity in the iron-selenide superconductors. Further work will focus on integrating these observations into the growing database of key materials properties for superconducting materials, in an effort to produce a global model of high-temperature superconductivity. This work was just published in Physical Review Letters [J. Guo et al., Phys. Rev. Lett. 108, 197001 (2012)].